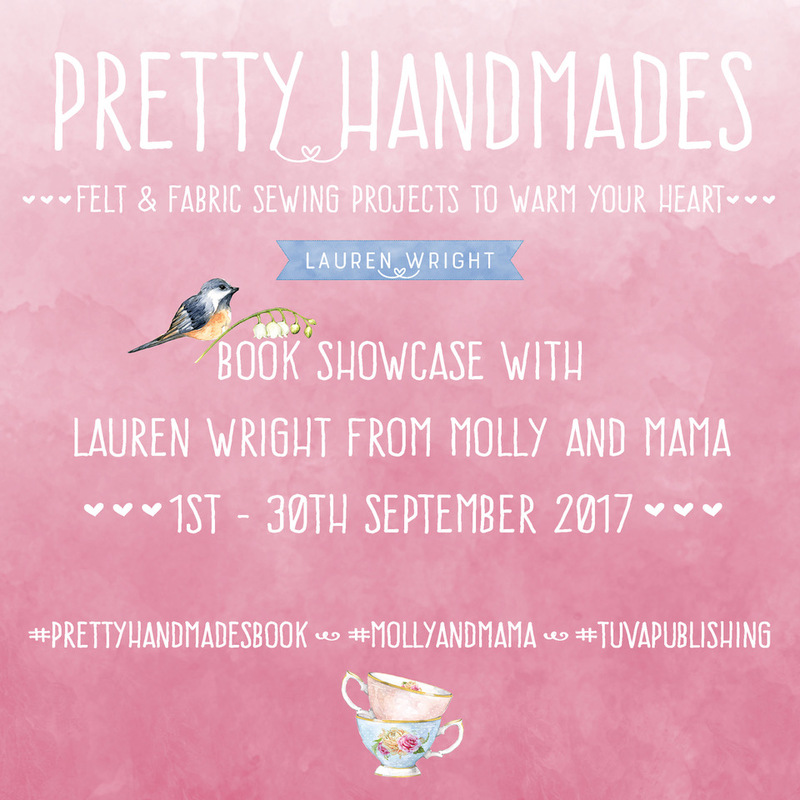 Welcome to my stop on the Pretty Handmades Book Showcase Tour! 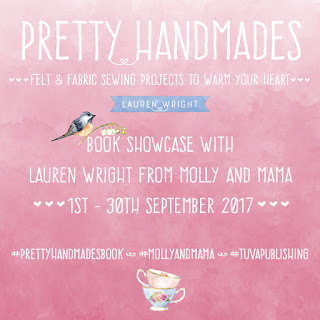 "Pretty Handmades: Sewing Projects to Warm Your Heart" is Lauren's first book, published by Tuva Publishing, which consists of 20 gorgeous projects designed in a true Molly and Mama style, combining pretty fabrics and wool felt. 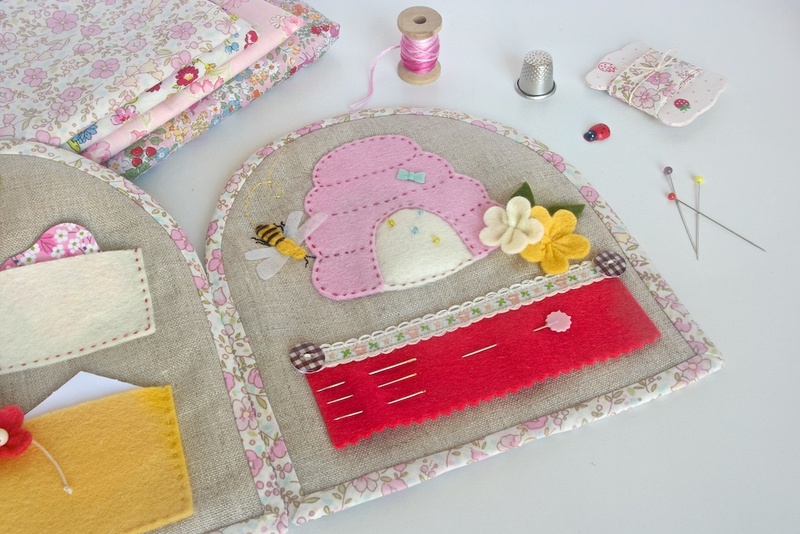 The well written instructions and pictures are suitable for sewists of all levels and make sewing a breeze. The book is filled with beautifully styled photos and pretty illustrations. There is also a part dedicated to basic quilting and patchwork techniques as well as tips on working with felt and a basic stitch guide at the beginning of the book. Pretty Handmades is available for pre-orders on Amazon. I met Lauren more than a year ago on Instagram and instantly fell in love with her creations. 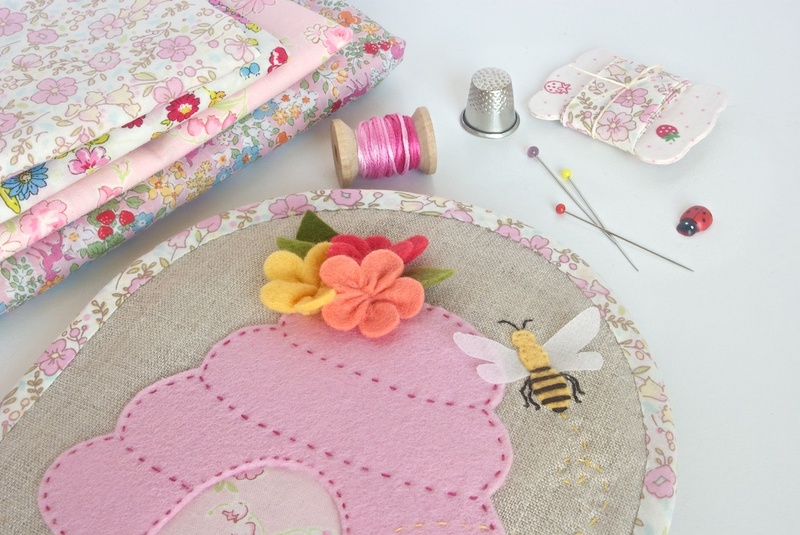 Pretty florals, wool felt in pastel colours and amazing attention to details is what defines her style. I am sure that many of you can easily recognise Lauren's makes, complemented with the most beautiful and delicate details. I was truly touched and delighted when Lauren asked me to take a part in her book tour and I enjoyed working on each project I chose for this event so very much. Thanks Lauren for this wonderful opportunity! When the book arrived in the mail from Tuva Publishing, I could not wait to go through it. I had my Little Companion next to me to marvel at each and every page. 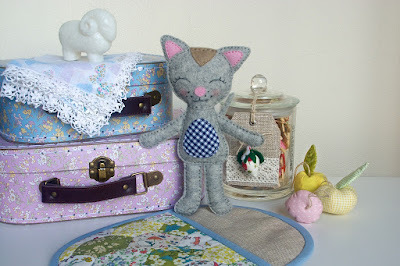 The first project we settled on was the Lullaby Kitty Felt Doll chosen by my Little One. He could not stop "meowing" and pointing at this cutie in the book, wanting to go back to page 55 over and over again. I decided to only use materials I had in my stash for all the projects and this speckled wool felt in lovely shade of grey from Two Blue Birdies was a perfect choice for the kitty. For the tummy I used a piece of Daddy's old shirt and for the cheeks I simply used my blush. I followed all the instructions apart from the choice of the stitch. I decided to use my favourite running stitch instead of a blanket stitch for all over the body of this kitten. It was an absolute pleasure to work on this project, sewn completely by hand. Easy, quick and fun! The Sweet Dreams Sleeping Bag was also made by the request of my Little Boy. He picked all the prints himself from my Liberty collection, insisting on greens and yellow. Elongated hexagons was a new English Paper Piecing shape to me and I have to say that I enjoyed making them a lot. I followed the pattern, but adjusted the style of the bag a bit so it would suit a boy more. I am sure that any little girl or boy would love going to sleep with a cute companion like this. I could not stay away from adding some small extra touches. I made a linen label for the back using Liberty and added a bit of "handwriting" in my favourite DMC embroidery floss #838. I have to be honest with you, I do not really like working with binding and I avoid it at any price. It generally scares me a lot, but this time around, using Lauren's instructions and tips, it was so easy. It went smoothly from the beginning to the end. 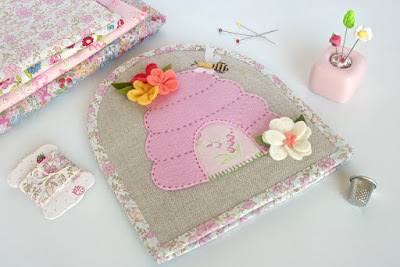 The very first project in this book is the Honey Hive Stitchy Book. A project that I fell in love with way before the book was published. 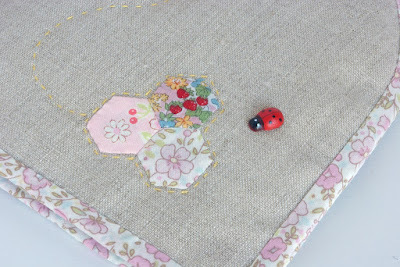 I had a sneak peek of one of the bees while Lauren was still secretly working on her book. So when I saw this project in her book, I could not wait to start working on it. 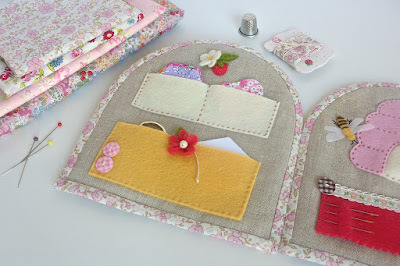 The combination of felt, linen and floral cotton is so lovely. I used 100% wool felt from Rose Petal Collections and Two Blue Birdies. Everything from making the base for the book to the very last petal was easy and fun. I followed the pattern, but changed the layout of the pages a bit to suit my own needs. For the bottom pocket I added a short hemp cord wrapped around a felt flower for the closure of the pocket, which would be great for keeping small scissors, papers and other notions. 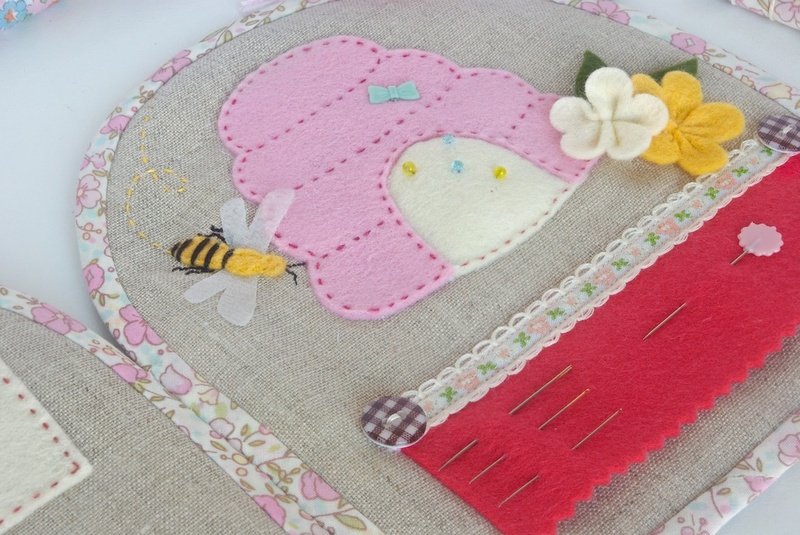 On the opposite side, there is a bee hive pincushion and a felt tab for pins and needles. Once again, the binding on this project went really easily to my own surprise. 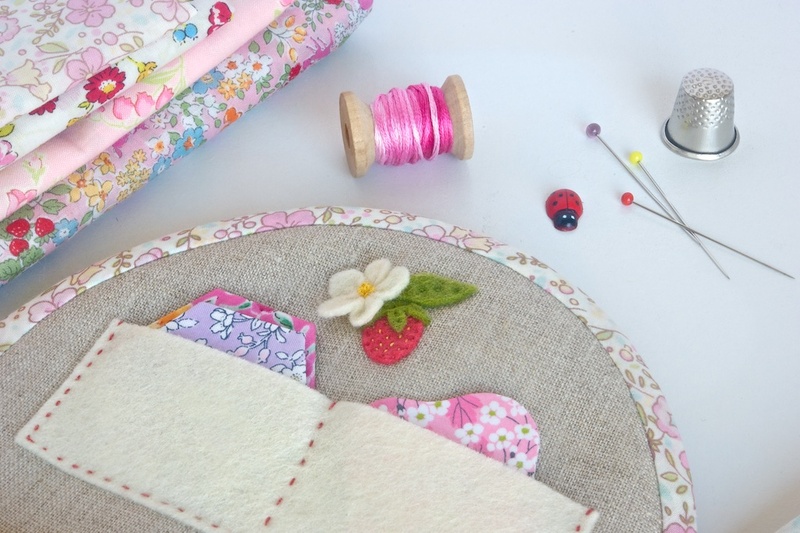 Maybe it was because of all the excitement of working on this pretty project, or because of the small size, but I did enjoy the entire process, from making my own binding using Yuwa Lawn cotton to blind stitch the binding. What I really like about this project is that it combines linen, cotton and wool felt, it can be adjusted to your own stitching needs and it can be prettified with all these gorgeous flowers and bees. For my bees I decided to go for the traditional yellow look (Lauren's bees are dark red and green) and instead of using felt for the wings, I settled on two layers of organza that gave the wings a new airy look. This pretty Honey Hive Stitchy Book is a perfect sewing accessory that can be used for any project at home or on the go. It is large enough to be used as a small lap working mat for some hand sewing. It was such a pleasure to work on this project! 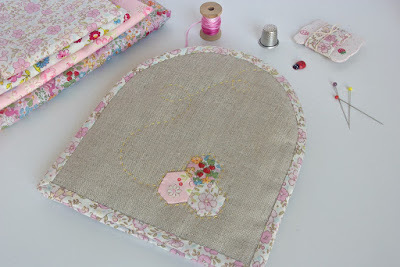 Small, pretty, easy and quick to finish as well. As you can see, the Book Showcase started on the 1st of September and going to be finished on the 30th of September. Below is the list of all the amazing and talented makers who are taking part in this fun tour. Make sure to check out all the wonderful makes on their blogs or Instagram! 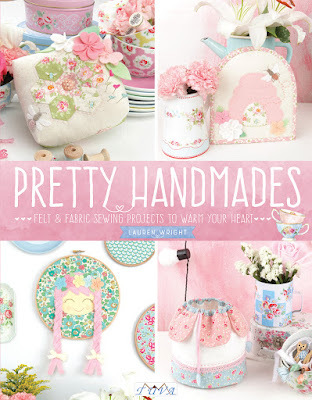 I can not wait to get this book and seeing your projects is making it harder to wait! By the way, I follow you on IG and love your work. 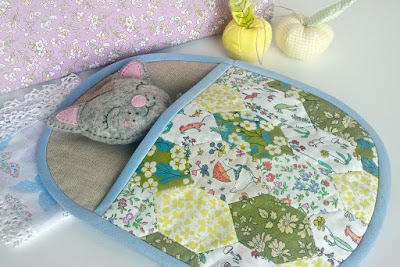 It is very inspiring to me as I have always loved small projects, but had gotten into the habit of making large quilts. Now I'm going to concentrate on smalls with all the cute details. Thanks for sharing! Your style and Lauren's projects go perfectly together. Your Little One obviously has his mother's artistic eye, doesn't he? 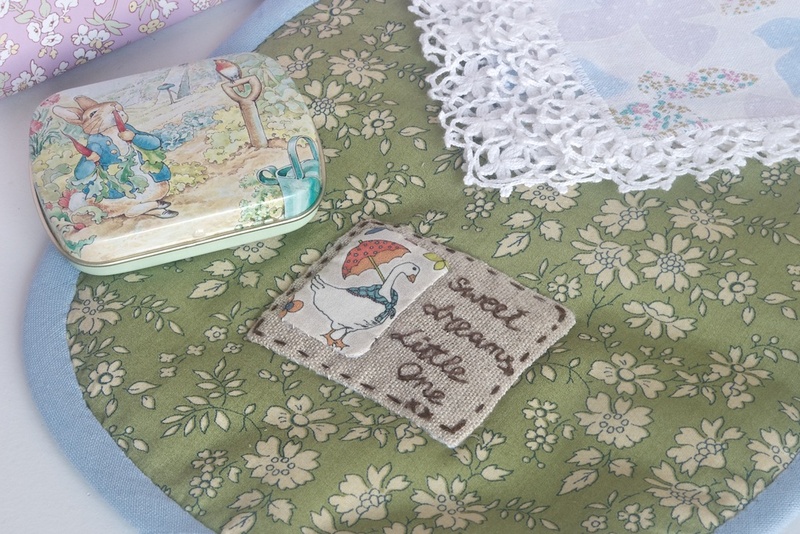 Love your whimsical take on these lovely makes, always fresh and special. VERY PRETTY NEEDLE CASE! THANKS FOR SHARING! Your makes are so very beautiful Larisa! I absolutely love your stitchybook! !